In this sweeping landscape, making up approximately a third of the Garden’s 52 acres, trees, shrubs, and herbaceous plants are systematically arranged by family to show their evolutionary progression. The collection starts with the more primitive plants (ferns and conifers), south of the Japanese Garden entrance, and ends with the composite family, across from the Rock Garden. To follow the story of evolution, visitors can stroll down the east side of the brook and back up the west side. Because water is the basis of all life, a tour of the Plant Family Collection begins at the Japanese pond. The first plants were algae; from them, terrestrial plants originated. The earliest land plants—the mosses and the liverworts—lack vascular tissue, the portion of a stem that conducts water from the roots to the leaves and usually assists in or acts as the support for the plant. Among the first vascular plants were the pteridophytes, or ferns, represented by glades of ferns along the shore of the Japanese pond. The earliest plants did not bear seeds, those typically tiny parcels of life that contain all the fundamental parts of a mature plant—leaf, stem, and root. Among these are the ferns, which instead form spores, simple single-celled reproductive structures. Early ferns first appeared some 300 to 350 million years ago during the carboniferous period. Like the mosses and liverworts, most ferns are confined to damp and shady areas, because their reproductive cycle requires water. Unlike their early brethren, however, ferns have primitive, though reasonably efficient, vascular systems, enabling some to grow into large tree-like specimens, known as tree ferns. In the Plant Family Collection, these early plants are represented by the lady fern, sensitive fern, and other ferns growing south of the Japanese pond. Nearby the ferns are the conifers—pines, junipers, cypresses, and their kin—the most familiar of the seed-bearing plants called gymnosperms. In most conifers, the seeds are found in woody structures called cones, which range in size from the gigantic two-foot cones of the monkey puzzle tree to the tiny cones of some junipers. Unlike the protected seeds of flowering plants, the seeds of gymnosperms, upon ripening, become exposed as the cone matures. Conifers, which have very efficient vascular systems, include some of the largest trees in the world—among them the sequoias, redwoods, and Douglas firs native to the American West. The waxy cuticle covering the leaves of conifers enables these plants to grow in drier habitats than the earliest plants could tolerate. The conifers in the Plant Family Collection range from towering blue Atlas cedar and sequoia, to a magnificent weeping form of the Canadian hemlock (Tsuga canadensis 'Pendula') to dwarf varieties such as hinoki false cypress (Chamaecyparis obtusa 'Nana'), suitable for small gardens. Not all gymnosperms are conifers. The well-known ginkgo, with its fan-shaped leaves, lacks cones. Its seeds are encased in a fleshy, malodorous outer coating. The tree, which has been grown in monastery gardens for thousands of years, is no longer found in its native habitat in China. Signs marking the specimen in Ginkgo Triangle tell the story of this tree's ancestors, which date back to the Triassic period, 225 to 190 million years ago. Magnolias and related plants, grouped by botanists in the subclass Magnoliidae, are among the most primitive of flowering plants. These plants have many primitive characteristics, most notably flowers with many parts, including numerous petals, sepals, and stamens arranged in a spiral. The flower parts are large and not joined together. What's more, the flowers are white or buff-colored, lacking the bright colors, fragrance, and nectar-secreting glands of subsequent flowers that evolved to attract later insects with highly developed senses of sight and smell. In fact, the early magnolias were pollinated quite incidentally when beetles and related insects visited the flowers to feed on them. Brooklyn Botanic Garden has been an important center for the development of new magnolias for gardeners, including yellow-flowered forms such as 'Elizabeth' and 'Yellow Bird'. When the simplest flower bloomed during the dinosaur era about 150 million years ago, it may already have been insect-pollinated because insect pollination had almost certainly occurred among the more advanced gymnosperms, such as the cycads. This was a great advance over most gymnosperms, which were pollinated passively by the wind. When Brooklyn Botanic Garden's Plant Family Collection was established early in this century, the elms, oaks, and walnuts were grouped together near the gymnosperms. It was then the prevailing view among many botanists that the inconspicuous, odorless, and often petal-less flowers of these plants were a primitive feature. In fact, these plants have reverted to the wind-pollination characteristic of the early seed plants. More recent scientific research has shown that simple does not necessarily mean primitive, and that oaks, elms, and walnuts are more highly evolved than once presumed. Members of the heath family, typically shrubs and occasionally trees or herbs, show considerable advancement beyond more primitive flowering plants such as magnolias. As flowering plants evolved, they exhibited flowers with fewer parts. Formerly free petals became fused or partially joined, and flowers of a number of families became asymmetrical. In the heaths, petals are fused almost to the tip, forming a tubular, trumpet-shaped bloom, but the flower has remained symmetrical. Heaths also have a peculiar way of shedding pollen: the anther, the sac that contains the pollen, opens through pores or slender tubes at its tip (in most other species, the anther splits open to release the pollen). The heaths are generally closely associated with root fungi called mycorrhizae, and are usually found in acidic soils. 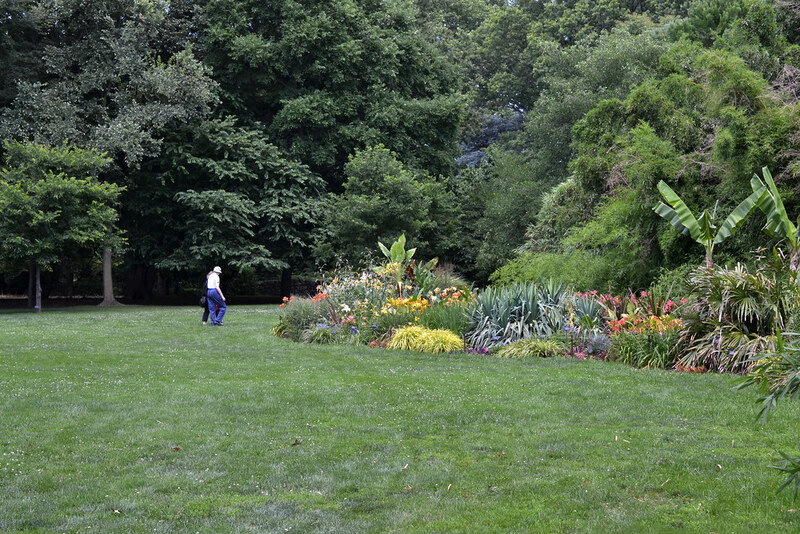 The Heath Family area is found at the southern tip of the Plant Family Collection, which is located almost at the southern terminus of the Brooklyn Botanic Garden, opposite the Children's Garden. Members of the Heath Family, or Ericaceae, displayed here include heaths, heathers, rhododendrons, azaleas, and mountain laurels. About 40 or 60 million years ago, bees and butterflies became more diverse and abundant, and flowers began to evolve in concert with them. Roses and related plants, grouped by botanists into the subclass Rosidae, do not depend on the vagaries of the wind for pollination; they have coevolved with the insects that pollinate their flowers and the animals that disperse their seeds. Different members of the rose family have developed their own particular structures that protect the female part of the flower to varying degrees. In the apple, the tissue surrounding the ovary becomes fleshy, forming the edible fruit. This fleshy tissue provides added protection to the ovary and also, as the seeds ripen, provides food for animals, which return the favor by disseminating the plant's seeds across the landscape. Closely related to the roses are the legumes. The fruits of this group of plants are pods, the most familiar of which are found in the pea, the bean, and the honey locust tree. Legumes as well as roses usually have compound leaves (leaves made up of leaflets) and stipules (appendages found toward the stem end of the leaf stalks). In the best-known legumes (the pea, for example), the flowers are quite distinctive—asymmetrical, an advanced feature—with a large petal above called a standard, two lateral petals called wings, and two petals below that are fused together called a keel. This distinct flower structure is adapted specifically for insect pollination—in fact, the flowers of some legumes are tailor-made for a single insect species. Some notable examples of legumes in the Plant Family Collection are pagoda tree (Sophora japonica) and Japanese wisteria (Wisteria floribunda). The Honeysuckle Family is a classic example of a group of plants that have coevolved with insects and other pollinators. Honeysuckles, abelias, and viburnums are all members of the Honeysuckle Family. Their distinctive blooms may be highly colorful and are often intensely fragrant. The flowers, which generally contain sweet nectar, are tube-shaped—highly adapted to the long probosces, or tongues, of pollinators such as butterflies, moths, and hummingbirds. 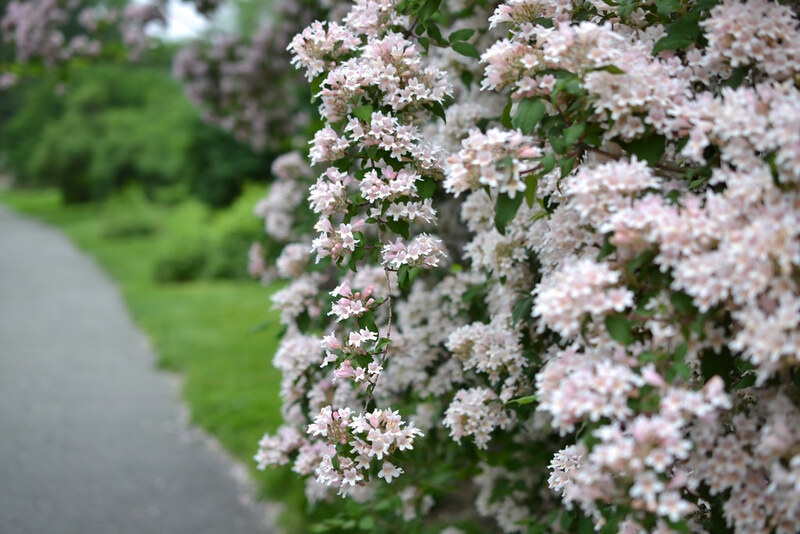 At Brooklyn Botanic Garden, members of the Honeysuckle Family are located south of the Rock Garden, along both sides of the path. Beautybush (Kolwitzia amabilis) and abelia (Abelia grandiflora) are two of the interesting specimens found there. Among the most advanced of flowering plants, members of the Daisy Family have a distinctive "composite" inflorescence, called a capitulum or head, in which numerous very small flowers are clustered together, mimicking a single flower. The central disk consists of many florets, each made up of five joined petals. Surrounding the central disk are ray florets, each with a large, prominent petal. The florets mature from the outermost to the innermost part of the disk, incorporating a number of characteristics that reduce the chance that pollen from one floret will fertilize one of its immediate neighbors— a highly sophisticated means of encouraging the cross-pollination (the transfer of pollen from a flower on one plant to a flower on another plant) that promotes genetic diversity in plant species. Stiff coreopsis (Coreopsis palmata), spotted Joe-pye weed (Eupatorium maculatum), and New England aster (Aster novae-angliae) are among the interesting composites found in the Plant Family Collection. The flowering plants are divided into two main subclasses: the monocots and the dicots. Monocots have one cotyledon (the first leaf produced on a seedling). They have leaves with parallel veins, and flower parts in threes or multiples of three—three or six petals and three or six stamens (the male parts of the flower), for example. As their name suggests, dicotyledons have two cotyledons, as well as net-veined leaves, and flower parts in fours or fives or multiples of four or five. Dicots are much more diverse than monocots, and it is generally understood that the monocots are derived from an aquatic dicot such as the water-lily. Botanists believe that monocots evolved from dicots by reduction—that is to say, by losing one of the two seed leaves found in every dicot. In the Plant Family Collection, the monocots are represented in the Monocot Border, overflowing with grasses, lilies, cannas, a banana tree, and other spectacular specimens. William Giambalvo is the curator of the south section of BBG’s Plant Family Collection. Visitors in the Plant Family Collection. Photo by Morrigan McCarthy. Kolkwitzia amabilis (beautybush) in the Plant Family Collection. Photo by Morrigan McCarthy.